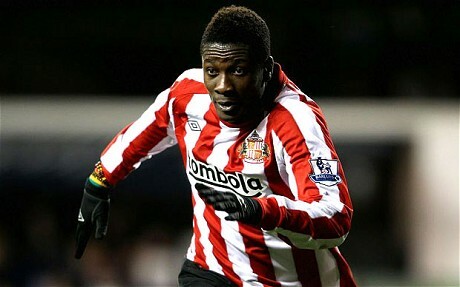 Both The Sun and The Daily Mail are suggesting this morning that big bad bullies Real Madrid are in the hunt for a new striker and that the new striker in question is none other than Sunderland’s all-singing, all-dancing hotshot Asamoah Gyan – who only moved to the Stadium of Light for a club record fee of £13 million just four short months ago. Apropos to nothing, both rags seem intent that Madrid coach Jose Mourinho is desperate to find a replacement for Gonzalo Higuain, who is facing a lengthy lay-off to undergo surgery on a hernia problem, and has settled on Gyan after deeming initial targets Edin Dzeko and Emmanuel Adebayor to be too over-priced/rated. So the question goes out. After a (fleetingly) impressive four-month cameo, should the Black Cats sell up if Real Madrid’s price is right in January i.e. consider Gyan a high-fallutin’ investment and move on? Or would they be wise to hold on to a player that, you’d hope, they’ve yet to see the best of? I always though he was too big for the Black Cats. Hmm, would he rather stay in the dull, snowy, rainy pit of North-East England or move to the sunny, tropical weather of Madrid. What a difficult decision (sarcasm).